There are clearly a few differences between a hardshell and inflatable kayaks, but the most important ones are durability, price and ease of use. These three things can make or break a kayak, and contrary to what you may think, inflatables do very well in these categories. These differences should not put you off buying an inflatable kayak, as some of them before just as well, if not better, than their hardshell counterparts. Our review will show you just how brilliant some inflatables really are. This is another brilliant inflatable kayak from Advanced Elements. This single-seater kayak is perfect for solo adventures on a lake, river, or even out on the bay. We wanted to test it where we tested the Advanced Elements Firefly, so we put on our wet shoes and headed to the lake. We wanted to test this kayak and see if it works well as a day-to-day kayak that the whole family can use, as well as beginners and kayaking professionals. We didn’t want to take the kayak out to sea as most inflatables do not perform well there. Inflatables are known for being very easy to store and to transport due to the fact that they fold down very small and are quite lightweight. The Lagoon is no different. We found it so simple to pack it up in our truck, and unpack it again once we were there. As for inflation, the Twistlok valve enables you to inflate and deflate the kayak very quickly and hassle-free. You can be inflated and ready to go in a matter of minutes, and there is no need for any technical set-up before you get in the water. Much like every other inflatable we have tested, great comfort is almost guaranteed each time. The soft bottom of the kayak is very comfortable to sit on for extended periods of time, and as long as it is properly inflated, you won’t cause yourself any discomfort. The Lagoon comes with a padded, high-support seat that is also removable. Many people will start to struggle with neck, shoulder and back pain when sitting in the kayak for an extended time, this seat prevents injury from setting in. One of the things we usually struggle with when it comes to inflatable kayaks is being able to paddle and steer it effectively. Inflatables are known for being a bit difficult to steer due to the fact that there is no rigidity. The Lagoon bypasses this problem by having built-in rigid panels that vastly improve the tracking and steering. These panels enable the kayak to handle rougher waters as well and still keep its steering and tracking performance maxed out. The kayak itself is made of a ripstop fabric that can withstand damage from most sources. It has electronically welded seams that can hold up to wear and tear, as well as years of use. The 6 chambers ensure you stay afloat long enough to get to shore in the event of a puncture. The kayak also comes with a very durable fabric cover, an inner tube cover which adds stiffness and abrasion protection. The outer cover not only adds protection but is also very lightweight, keeping the overall weight way down. The kayak is jam-packed with extra features, but it does have enough for them to be noteworthy. We have already mentioned the very comfortable padded seat, it also has rubber moulded handles and bungee lacing on the deck for storage. The kayak also comes with an inflatable coaming for a spray skirt attachment. For ease of use, there is a paddle holder, a carrying duffel bag, and a very handy repair kit that can fix most damage and problems. 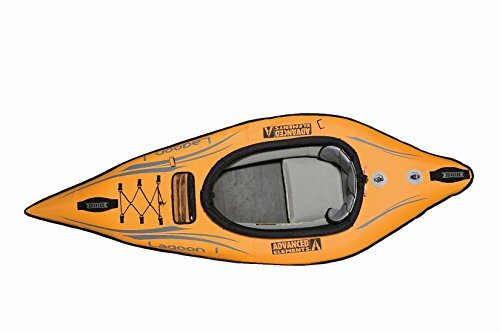 The only downside to otherwise perfect Advanced Elements kayaks is the price. They are almost always worth the price, but if you are looking for a fun piece of gear to use every now and then on holidays, you may not want to fork out that much cash. There are multiple kayaks that are cheaper, the Intex Challenger K1 for example, but Advanced Elements make their kayaks with a quality and craftsmanship that is unmatched right now in the market. It may be a steep price, but it is one you are only going to have to pay once. 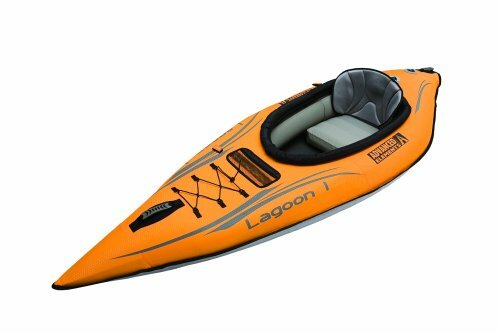 The Lagoon is a serious competitor for the best inflatable and even solo kayak on the market. The quality is incredible and it is so simple to use and inflate. It is a great kayak for beginners and pros alike, and for the solo paddler or for family fun. If you are looking for a worthy investment, and a kayak that will last you or your family for many years to come, the Lagoon is well worth the money and is a kayak that should definitely not miss out on. Rrtizan Snorkel Vest, The Best Snorkel Vest?